Southern-rock phenomenon Zac Brown Band and Grammy-nominated Californian vocalist Beth Hart are the latest acts to be announced for this year’s BluesFest, which returns to The O2 from 25 -28 October 2018. Joining Robert Plant, Van Morrison, Creedence Clearwater Revival’s John Fogerty, Steve Miller Band, Robert Cray and Raphael Saadiq on the line-up for the four-day event, Zac Brown Band and Beth Hart will perform in The Arena on Saturday 27 October. Known for blurring the boundaries between country, blues, reggae and rock, the multi-platinum-selling, Grammy-winning Zac Brown Band are widely regarded as one of the world’s most exciting live acts and played to more than a million fans in 2017. They make their much-anticipated BluesFest debut in October, returning to London following the release of their internationally acclaimed album “Welcome Home”. 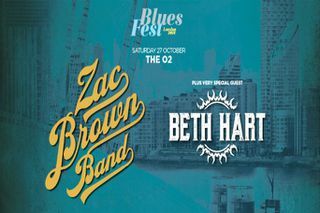 Hailed by The Guardian as “daring, brooding and angry”, Californian singer Beth Hart, who has collaborated with the likes of Joe Bonamassa, Jeff Beck and Slash, returns to BluesFest following a standout performance in 2014. Zac Brown Band is not available to book, please sign up to our newsletter for updates and offers on forthcoming and available shows.